1. Why should I use IRIS Connect? Over the past few years technology has proven to be a powerful tool for delivering high-quality, evidence-based development opportunities for teachers and schools. We have combined the latest technology with secure cloud-based storage to reduce the cost and open up the possibilities for secure, teacher driven video CPD. Learn more about what we do here. 2. How does IRIS Connect work? IRIS Connect allows you to record your lessons, quickly and easily, using our mobile camera systems. After a recording has taken place, the video is uploaded directly to your personal password-protected account in our online platform where you can watch it back for your own personal reflection or share with a colleague for feedback. 3. I can’t remember how to set IRIS Connect up, where can I get help? We’ve created a series useful videos and guides online that show you how to set up IRIS Connect and schedule reflections, step-by-step. Our support team are also on hand to offer their advice and guidance via phone, email or live chat. 4. Is it necessary for me to use the wireless microphones? Yes. Audio is the most important aspect when recording a lesson. You want to be able to hear everything that’s going on in your classroom; keeping up-to-date with audio technology is key, so our microphones use the best available wireless technology. Wearing the wireless microphone will allow all audio between you and your students to be clearly recorded. 5. How much does IRIS Connect cost? Whether you are a small Primary school or a large University, you can adapt our packages to suit your teachers’ professional development needs. Complete the form on the right to get a personalised quote for your school or organisation. 6. How do I encourage staff to use it and share their videos? To make sure you and your colleagues get the most out of our technology, we have put together the Teaching is Learning (TisL) programme to support its use in your school. Through the programme we’ll help teachers feel comfortable with the technology, provide you with check-lists, survey tools, help sheets, strategy maps and feedback tools linked to educational strategies, help you to identify pathfinders and whole school objectives, and much more. 7. Why can’t I record my lessons with my own device? You can, but storing your videos in our secure, online platform minimises the inherent security risk of capturing and storing videos on personal devices and on school servers. It also means that you can access your own personal library of professional development anywhere, at any time, and securely share your recordings with colleagues should you wish to. Besides security, our platform also enables all of the key interactions that help you to go beyond simply reviewing videos. You can use time-stamped comments and forms to add contextualised feedback and gain deeper insight into your lessons, or use the editing tool to select the best parts of your lesson. You can even share securely with individual colleagues or groups in your school or across schools. 8. Who can see my videos? IRIS Connect is built around an advanced permissioning system where you – the teacher – are in control of all your videos. Each IRIS Connect user has their own unique and secure username and password. Each video you record will be stored in your account in your personal library. No-one can access any video located in another user’s personal library. Each user has the option to share the videos from their personal library with others, but they can revoke access at any time, and the person who they share their videos with is not able to share the videos with anyone else. 9. What is live in-ear coaching? Live in-ear coaching helps you to embed effective teaching strategies in the moment, ensuring that they really stick. During a live in-ear coaching session a teacher is viewed remotely, using IRIS Connect’s LiveView camera, by a coach who communicates privately with the teacher via a discrete wireless earpiece. The coach and the teacher work out the best way to talk to each other and consider things such as what will be said, when and for how long. Its power seems to lie in how immediate it is. A teacher can receive quality feedback and developmental suggestions while they are teaching. This means that they can try out new ideas or adjust a particular strategy in front of their coach and get more help and feedback in the moment. And of course the whole session can be recorded and annotated with written comments for a face to face debrief later on. 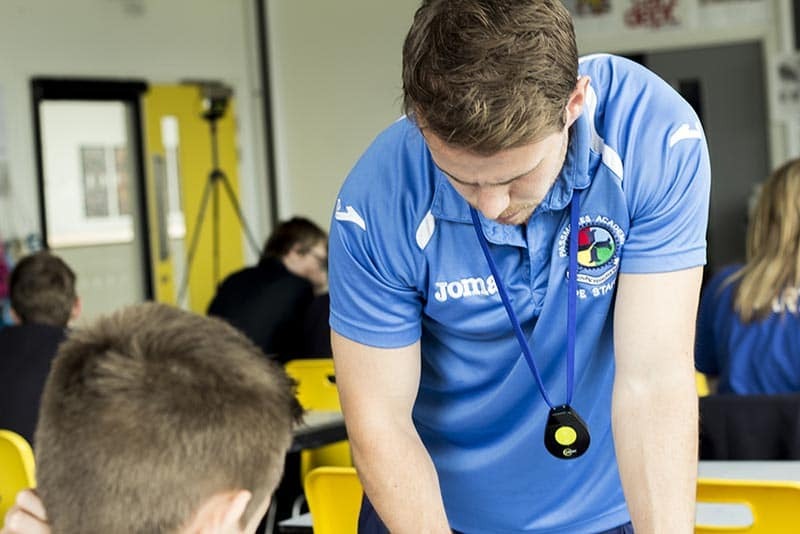 Check out how one school has used in-ear coaching to build a sustainable coaching culture. 10. How do I best communicate the use of IRIS Connect to parents? Using video for the purposes of CPD is usually covered in your home school agreement. For more information and advice please contact us. Find out how much IRIS Connect can help your organisation save on staff development.